The Los Angeles Times, commonly referred to as the Times or LA Times, is a paid daily newspaper published in Los Angeles, California, since 1881. It was the largest metropolitan newspaper in circulation in the United States in 2008 and the fourth most widely distributed newspaper in the country. 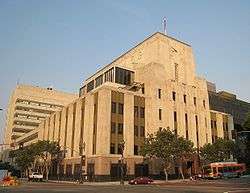 In 2000, the Tribune Company, parent company of both the Chicago Tribune and local television station KTLA, purchased the Los Angeles Times by acquiring its parent company, the Times Mirror Company. The Times is currently owned by Tronc, Inc., formerly known as Tribune Publishing. The Times was first published on December 4, 1881, as the Los Angeles Daily Times under the direction of Nathan Cole Jr. and Thomas Gardiner. It was first printed at the Mirror printing plant, owned by Jesse Yarnell and T.J. Caystile. Unable to pay the printing bill, Cole and Gardiner turned the paper over to the Mirror Company. In the meantime, S.J. Mathes had joined the firm, and it was at his insistence that the Times continued publication. In July 1882, Harrison Gray Otis moved from Santa Barbara to become the paper's editor. Otis made the Times a financial success. In an era where newspapers were driven by party politics, the Times was directed at Republican readers. As was typical of newspapers of the time, the Times would sit on stories for several days, notably including the 1884 victory of Democratic presidential candidate Grover Cleveland. Historian Kevin Starr wrote that Otis was a businessman "capable of manipulating the entire apparatus of politics and public opinion for his own enrichment". Otis's editorial policy was based on civic boosterism, extolling the virtues of Los Angeles and promoting its growth. Toward those ends, the paper supported efforts to expand the city's water supply by acquiring the rights to the water supply of the Owens Valley in the California Water Wars, a set of events fictionalized in the Roman Polanski movie Chinatown. In 2000, the Tribune Company acquired the Times, placing the paper in co-ownership with then-WB (now CW)-affiliated KTLA, which Tribune acquired in 1985. For two days in 2005, the Times experimented with Wikitorial, the first Wiki by a major news organization to allow readers to combine forces to produce their own editorial pieces. However, it was shut down after a few people besieged it with inappropriate material. In December 2008, the Tribune Company filed for bankruptcy protection. Baquet was the first African-American to hold this type of editorial position at a top-tier daily. During Baquet and Carroll's time at the paper, it won 13 Pulitzer Prizes, more than any other paper but the New York Times. However, Baquet was removed from the editorship for not meeting the demands of the Tribune Group — as was publisher Jeffrey Johnson — and was replaced by James O'Shea of the Chicago Tribune. O'Shea himself left in January 2008 after a budget dispute with publisher David Hiller. The changes and cuts were controversial, prompting criticism from such disparate sources as a Jewish Journal commentary, an anonymously written employee blog called Tell Zell and a satirical Web site, Not the L.A. Times. In January 2009, the Times increased its single copy price from 50 to 75 cents and eliminated the separate California/Metro section, folding it into the front section of the newspaper. The Times also announced seventy job cuts in news and editorial, or a 10 percent cut in payroll. The Times's reported daily circulation in October 2010 was 600,449, down from a peak of 1.1 million. Some attributed the drop in circulation to the increasing availability of alternate methods of obtaining news, such as the Internet, cable TV and radio. Others believed that the drop was due to the retirement of circulation director Bert Tiffany. Still others thought the decline was a side effect of a succession of short-lived editors who were appointed by publisher Mark Willes after publisher Otis Chandler relinquished day-to-day control in 1995. Willes, the former president of General Mills, was criticized for his lack of understanding of the newspaper business, and was derisively referred to by reporters and editors as The Cereal Killer. Despite the circulation decline, many in the media industry lauded the newspaper's effort to decrease its reliance on "other-paid" circulation in favor of building its "individually paid" circulation base — which showed a marginal increase in a circulation audit. This distinction reflected the difference between, for example, copies distributed to hotel guests free of charge (other-paid) versus subscriptions and single-copy sales (individually paid). On July 10, 2007, Times launched a local Metromix site targeting live entertainment for young adults. A free weekly tabloid print edition of Metromix Los Angeles followed in February 2008; the publication was the Times' first stand-alone print weekly. In 2009, the Times shut down Metromix and replaced it with Brand X, a blog site and free weekly tabloid targeting young, social networking readers. Brand X launched in March 2009; the Brand X tabloid ceased publication in June 2011 and the website was shut down the following month. On November 12, 2005, new Op-Ed Editor Andrés Martinez shook things up by announcing the firing of liberal op-ed columnist Robert Scheer and conservative editorial cartoonist Michael Ramirez, replacing the two with a more diversified lineup of regular columnists. The Times drew fire for a last-minute story before the 2003 California recall election alleging that gubernatorial candidate Arnold Schwarzenegger groped scores of women during his movie career. Columnist Jill Stewart wrote on the American Reporter website that the Times did not do a story on allegations that former Governor Gray Davis had verbally and physically abused women in his office and that the Schwarzenegger story relied on a number of anonymous sources. Further, she said, four of the six alleged victims were not named. She also said that in the case of the Davis allegations, the Times decided against printing the Davis story because of its reliance on anonymous sources. The American Society of Newspaper Editors said that the Times lost more than 10,000 subscribers because of the negative publicity surrounding the Schwarzenegger article. In 2016, the Times won the breaking news Pulitzer prize for its coverage of the mass shooting in San Bernardino California. By the mid-1940s, the Times was the leading newspaper in terms of circulation in the Los Angeles metropolitan area. In 1948, it launched the Los Angeles Mirror, an afternoon tabloid, to compete with both the Daily News and the merged Herald-Express. In 1954, the Mirror absorbed the Daily News. The combined paper, the Mirror-News, ceased publication in 1962, when the Hearst afternoon Herald-Express and the morning Los Angeles Examiner merged to become the Herald-Examiner. The Herald-Examiner published its last number in 1989. Today the second-largest daily newspaper in Los Angeles is the San Fernando Valley-based Los Angeles Daily News (unrelated to the aforementioned defunct publication). A subsidiary, Times Community Newspapers, publishes the Burbank Leader, Coastline Pilot of Laguna Beach, Crescenta Valley Sun, Daily Pilot of Newport Beach and Costa Mesa, Glendale News-Press, Huntington Beach Independent and La Cañada Valley Sun. Among the Times' staff are columnists Steve Lopez and Patt Morrison, food critic Jonathan Gold, television critic Mary McNamara and film critic Kenneth Turan. Sports columnists include Bill Plaschke, who is also a panelist on ESPN's Around the Horn, and Helene Elliott, the first female sportswriter to be inducted into the Hockey Hall of Fame. The Times Mirror Corporation has also owned a number of book publishers over the years including New American Library, C.V. Mosby, as well as Harry N. Abrams. In 1960 Times Mirror of Los Angeles bought the book publisher New American Library known for publishing affordable paperback reprints of classics and other scholarly works. The NAL continued to operate autonomously from New York and within the Mirror Company. And in 1983 Odyssey Partners and Ira J. Hechler bought NAL from the Times Mirror Company for over $50 million. In 1967 Times Mirror acquired C.V. Mosby Company a professional publisher and merged it over the years with several other professional publishers including Resource Application, Inc., Year Book Medical Publishers, Wolfe Publishing Ltd., PSG Publishing Company, B.C. Decker, Inc., among others. Eventually in 1998 Mosby is then sold to Harcourt Brace & Company to form the Elsevier Health Sciences group. ↑ "Total Circ for US Newspapers". Alliance for Audited Media. March 31, 2013. Retrieved June 16, 2013. ↑ Pérez-Peña, Richard (October 27, 2008). "Newspaper Circulation Continues to Decline Rapidly". The New York Times. ISSN 0362-4331. Retrieved 2016-07-09. 1 2 "Tribune called on to sell L.A. Times". CNN. September 18, 2006. Retrieved June 19, 2012. ↑ "Mirror Acorn, 'Times' Oak," Los Angeles Times, October 23, 1923, page II-1 Access to this link requires the use of a library card. ↑ James L. Baughman (April 20, 2011). "The Fall and Rise of Partisan Journalism". ethics.journalism.wisc.edu. Retrieved October 27, 2013. ↑ Starr, Kevin (1985). Inventing the Dream: California Through the Progressive Era. New York: Oxford University Press. p. 228. ISBN 0-19-503489-9. OCLC 11089240. ↑ Berges, Marshall. The Life and Times of Los Angeles: A Newspaper, A Family and A City. New York: Atheneum. p. 25. 1 2 McDougal, Dennis (2002). Privileged Son: Otis Chandler and the Rise and Fall of the L.A. Times Dynasty. Cambridge, Mass. : Da Capo. ISBN 0-306-81161-8. OCLC 49594139. ↑ Hiltzik, Michael (August 6, 2013). "Washington Post Buy: Can Jeff Bezos Fix Newspapers' Business Model?". Los Angeles Times. Retrieved October 6, 2014. ↑ ProQuest Dissertation Abstracts. Retrieved June 8, 2007. ↑ James Rainey & Michael A. Hiltzik (December 9, 2008). "Owner of L.A. Times files for bankruptcy". Los Angeles Times. ↑ "Tribune goes to Zell". Chicago Sun-Times. April 3, 2007. Archived from the original on September 18, 2008. ↑ Pappu, Sridhar (March–April 2007). "Reckless Disregard: Dean Baquet on the gutting of the Los Angeles Times". Mother Jones. ↑ Hiltzik, Michael A. (July 3, 2008). "Los Angeles Times to cut 250 jobs, including 150 from news staff: The newspaper cites falling ad revenue in economic slowdown". Los Angeles Times. ↑ Politi, Daniel (July 3, 2008). "Today's Papers: "You Have Been Liberated"". Slate.com. ↑ By TJ Sullivan (2009-01-13). "Los Angeles Times Ups Newsstand Price". Nbclosangeles.com. Retrieved 2016-08-08. ↑ Roderick, Kevin (2009-01-30). "Los Angeles Times kills local news section". LA Observed. Retrieved 2016-08-08. ↑ Ravi Somaiya (September 20, 2015). "A Firing at The Los Angeles Times Focuses Discontent". The New York Times. Retrieved September 21, 2015. ↑ Somaiya, Ravi (September 8, 2015). "Austin Beutner Ousted as Los Angeles Times Publisher". New York Times. ↑ Mullin, Benjamin (2015-10-05). "Tribune Publishing CEO announces buyouts". Poynter. Retrieved 2016-08-08. ↑ "For the 'funemployed,' unemployment is welcome". LA Times. 2009-06-04. Retrieved 2016-08-08. 1 2 E&P Staff (May 28, 2007). "Pulitzer Winner Explains Why She Took 'L.A. Times' Buyout". Editor & Publisher. Nielsen Business Media, Inc. Retrieved May 28, 2007. 1 2 Cleeland, Nancy (May 28, 2007). "Why I'm Leaving The L.A. Times". Huffington Post. ↑ Bill Cromwell (April 26, 2010). "Like Newspaper Revenue, the Decline in Circ Shows Signs of Slowing". editorandpublisher.com. Retrieved April 26, 2010. ↑ As told to RJ Smith. "Ripped from the headlines - Los Angeles Magazine". Lamag.com. Retrieved January 12, 2009. ↑ Shaw, David. "Crossing the Line". Los Angeles Times. Retrieved October 3, 2016. ↑ Shah, Diane, "The New Los Angeles Times" Columbia Journalism Review 2002, 3. 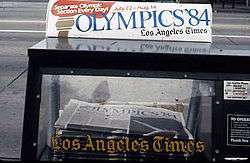 ↑ Rainey, James, "Newspaper Circulation Continues to Fall," Los Angeles Times May 1, 2007: D1. ↑ E&P Staff (May 25, 2007). "California Split: 57 More Job Cuts at 'L.A. Times'". Editor & Publisher. Nielsen Business Media, Inc. Retrieved May 28, 2007. ↑ Lieberman, David (May 9, 2006). "Newspaper sales dip, but websites gain". USATODAY.com. 1 2 Saar, Mayrav (January 26, 2007). "LAT's Scathing Internal Memo. Read It Here.". FishbowlLA. mediabistro.com. ↑ Roderick, Kevin (January 24, 2007). "Times retools on web — again". LA Observed. ↑ Welch, Matt (January 24, 2007). "Spring Street Project unveiled!". latimes.com. ↑ "Metromix Makes Cool Debut". latimes.com. July 10, 2007. Retrieved October 3, 2013. ↑ Ives, Nate (February 13, 2008). "Los Angeles Times Launches Free Weekly". Advertising Age. Retrieved October 3, 2013. ↑ "Editor announces weekly tabloid aimed at social-networking readers". latimes.com. March 25, 2009. Retrieved October 3, 2013. ↑ Roderick, Kevin (June 29, 2011). "L.A. Times folds Brand X". LA Observed. Retrieved October 3, 2013. ↑ Elder, Sean (November 5, 1999). "Meltdown at the L.A. Times". Salon.com. Retrieved March 26, 2007. ↑ Astor, Dave (January 5, 2005). "'L.A. Times' Drops Daily 'Garfield' as the Comic Is Blasted and Praised". Editor & Publisher. Nielsen Business Media, Inc. Archived from the original on January 7, 2005. Retrieved March 26, 2007. ↑ Muravchik, Joshua (November 19, 2006). "Bomb Iran". Los Angeles Times. Retrieved March 26, 2007. ↑ Rainey, James (March 22, 2007). "Editor Resigns over Killed Opinion Section". Los Angeles Times. Archived from the original on March 25, 2007. Retrieved March 26, 2007. ↑ Martinez, Andrés (March 22, 2007). "Grazergate, an Epilogue". Los Angeles Times. Retrieved March 26, 2007. ↑ Stewart, Jill (October 14, 2003). "How the Los Angeles Times Really Decided to Publish its Accounts of Women Who Said They Were Groped" (PDF). jillstewart.net. Archived from the original on October 14, 2003. ↑ Cohn, Gary; Hall, Carla; Welkos, Robert W. (October 2, 2003). "Women Say Schwarzenegger Groped, Humiliated Them". The Los Angeles Times. Archived from the original on October 2, 2003. ↑ "ASNE recognizes Los Angeles Times editor for leadership". ASNE.org. American Society of Newspaper Editors. March 24, 2004. ↑ "Los Angeles Times". Los Angeles Times. April 18, 2016. Retrieved April 18, 2016. ↑ "Los Angeles Times – Media Center". Los Angeles Times. January 17, 1994. Retrieved January 12, 2009. ↑ "1999 Pulitzer Prize winners for beat reporting". Columbia journalism review. Retrieved May 29, 2012. ↑ Shaw, David (April 13, 1999). "2 Times Staffers Share Pulitzer for Beat Reporting". Los Angeles Times. Retrieved July 30, 2012. ↑ "The Pulitzer Prizes | Biography". Pulitzer.org. October 18, 1956. Retrieved August 16, 2010. ↑ "2009 Pulitzer Prizes: Journalism". Reuters. April 20, 2009. Retrieved October 6, 2014. ↑ "The Pulitzer Prizes | Citation". www.pulitzer.org. Retrieved 2015-11-13. ↑ "December 1903: Hearst's Examiner comes to L.A". Ulwaf.com. Retrieved October 21, 2012. ↑ Red Ink, White Lies: The Rise and Fall of Los Angeles Newspapers, 1920–1962 by Rob Leicester Wagner, Dragonflyer Press, 2000. ↑ Leonard Pitt and Dale Pitt, Los Angeles: A to Z, University of California Press, ISBN 0-520-20274-0. ↑ "Harrison Gray Otis Southern California Historical Society". Socalhistory.org. 2016-05-25. Retrieved 2016-08-08. ↑ "Our Annual Trade Number," Los Angeles Times, December 18, 1886, page 4 Access to this link requires the use of a library card. ↑ "Our Annual Edition," Los Angeles Times, December 21, 1888, page 4 Access to this link requires the use of a library card. ↑ "General Contents," Los Angeles Times, January 1, 1895 Access to this link requires the use of a library card. ↑ Quoted in "Highest Praise Given to 'Times,'" Los Angeles Times, January 28, 1923, page II-12 Access to this link requires the use of a library card. ↑ Display advertisement, Los Angeles Times, December 13, 1947 Access to this link requires the use of a library card. ↑ "Bigger and Better Than Ever," page F-10 Access to this link requires the use of a library card. ↑ "'The Land and Its Fruits' — Our Harvest Number," Los Angeles Times, September 5, 1891, page 6 Access to this link requires the use of a library card. ↑ "Ready Tomorrow," Los Angeles Times, September 4, 1891, page 4 Access to this link requires the use of a library card. ↑ "Los Angeles Times website". latimes.com. April 17, 2014. Retrieved October 6, 2014. 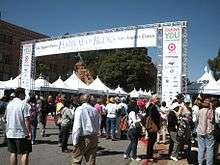 ↑ "Los Angeles Times Festival of Books". Retrieved October 6, 2014. ↑ rebecca Buddingh · Daily Trojan (September 26, 2010). "L.A. Times fair comes to USC | Daily Trojan". Dailytrojan.com. Retrieved October 21, 2012. ↑ "Los Angeles Times Book Prizes home page". Retrieved October 6, 2014. 1 2 McDowell, Edwin (August 11, 1983). "Times Mirror is Selling New American Library". The New York Times. Retrieved October 3, 2015. ↑ Korda, Michael (1999). Another life : a memoir of other people (1st ed.). New York: Random House. p. 103. ISBN 0679456597. ↑ "Mosby Company History". Elsevier. Retrieved October 3, 2015. ↑ Storch, Charles (June 27, 1986). "Times Mirror Selling Dallas Times Herald". Chicago Tribune. Retrieved June 26, 2012. ↑ "Johnson family sells Austin TV." Broadcasting, September 4, 1972, pg. 6. ↑ "Times Mirror's deal for Newhouse's TVs gets FCC approval." Broadcasting, March 31, 1980, pg. 30. ↑ "Changing hands: Proposed." Broadcasting, September 30, 1985, pg. 109. ↑ "Times Mirror set to sell four TV'." Broadcasting and Cable, March 22, 1993, pg. 7. Prochnau, William (January–February 2000). "The State of The American Newspaper: Down and Out in L.A.". American Journalism Review. College Park: University of Maryland Foundation.